It could be days before power is restored to all of the hundreds of thousands of people who lost it during an early season weekend storm that dumped wet, heavy snow across the state, particularly in Western and Central Massachusetts. Gov. Deval Patrick declared a state of emergency, allowing him to mobilize the National Guard to help hard-hit cities and towns. Soldiers were out this morning helping chain saw crews remove fallen trees so utility workers could get to downed wires. More than 800 members of the National Guard have been activated statewide to help cities and towns deal with the aftermath of the weekend snowstorm, Lt. Gov. Timothy P. Murray said at a press conference this afternoon at the Worcester Emergency Operations Center on Grove Street. As of early this afternoon, about 650,000 people were still without power statewide, including more than 26,000 in Worcester, according to Mr. Murray, who urged people without electricity to try to remain patient until service is restored. “It's going to take time given the magnitude of the damage, and it is labor-intensive,” Mr. Murray said. “We're pushing the utility companies as hard as we can and we've got the public safety crews out,” he said. Several school districts in the region, including Worcester, Shrewsbury, Northboro-Southboro, Auburn, Tantasqua Union 61, Dudley-Charlton, Athol-Royalston, Harvard and Oxford school districts have all canceled school for tomorrow, Monday, Oct. 31. Notre Dame Academy also canceled school. "It's not only a lot of snow, but a lot of the heaviest wettest snow that you ever want to see out there," said Peter Judge, spokesman for the Massachusetts Emergency Management Agency. A lifelong New Englander used to the winter storms, Carolyn Bourget went to bed last night, without power, but expecting a normal winter in the city. When she woke up this morning and looked out from her porch on South Edlin Street in Worcester, it turned out to be more than expected. A nurse at UMass Memorial Medical Center — University Campus, Mrs. Bourget had to call the hospital and tell co-workers she couldn't get out. This evening, National Grid reported about 410,000 customers still without power in Massachusetts. Worcester had roughly 22,000 customers without power this afternoon, according to National Grid. National Grid is part of the city's Emergency Operations Center staffing. According to the city, National Grid was out assessing damage and dealing with life safety issues. All restorations will begin tomorrow and continue until all power is restored. Forest Grove Middle School, 495 Grove St., Worcester, opened as an emergency shelter at 5 p.m. Charlton is referring residents who have no power to Tantasqua Regional High School in Sturbridge. Across the state, crews were working to restore electricity to hospitals, nursing homes and other facilities first and could not say how long it might take to get power back on for everyone. "This is not going to be a quick fix," said Mr. Judge, of MEMA. "It's totally smashing any historical records." Most customers in Northboro, Leominster, Dudley, Grafton, Lancaster and Southbridge have lost power. The entire towns of Hardwick, East Brookfield, Oakham and Berlin have lost power. Holden and Paxton, which have municipal power companies, also lost power. As of 10 p.m., 36,144 of Unitil's 103,000 electric customers systemwide were reporting no power, down from an overnight peak of 70,000. Of those customers, 15,337 of Unitil's 28,000 customers in Massachusetts were without power and 20,807 of Unitil's 75,000 customers in New Hampshire were without power. Unitil serves Fitchburg, Lunenburg, Townsend and Ashby. Approximately 300 crews, some from as far away as Michigan, Pennsylvania and Canada, have been secured to assist with what is expected to be a multiday restoration effort for the areas hit hardest by the storm, including northern Central Massachusetts and the New Hampshire seacoast area. The crews provide specialized work and include line, tree, digger, damage assessment and wires down teams. Crews worked overnight on public safety issues in coordination with municipal emergency responders, while restoring power where possible. No estimates on restoration time are expected until the damage assessment phase of the effort is complete. The damage assessment phase is a critical part of the restoration process. Unitil customers in Massachusetts experiencing outages should call the following toll-free number: (888) 301-7700. In Shrewsbury, about 2,000 customers were still without power at 5 p.m., down from about 2,700 customers this morning, according to Jackie Pratt, manager of marketing and customer care for SELCO, the town power and cable provider. All of SELCO's five crews were working to restore power, along with four crews called in to assist from Taunton and Connecticut, she said. 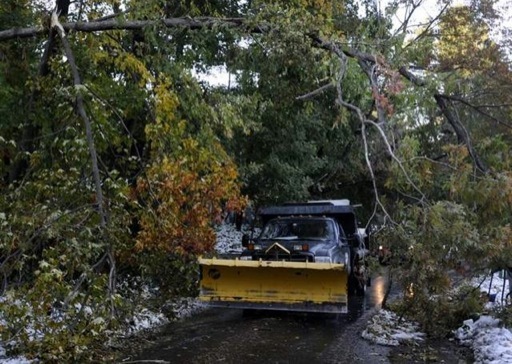 For Shrewsbury, the storm's effects were even worse than those of the ice storm of 2008. Of particular concern was the Oak Street area of town, where power lines that run through an area of deep woods sustained particularly heavy damage. “We are trying to find a work-around to get power back on for people in that area and then later go back into the woods,” she said. Shrewsbury opened the Senior Center at 98 Maple Ave. at 3 p.m. as an emergency shelter. Auburn Detective Sgt. Jeffery Lourie said downed tree limbs closed roads throughout town and wreaked havoc on power. National Grid reported 4,857 of its 7,579 customers in Auburn were without power today. Auburn High School has been opened as a shelter, and if people are struggling to get there they are advised to call Auburn police. Auburn police are heading into Worcester and finding gas stations in the city to fuel up, Sgt. Lourie added. State police are reporting that the restrictions on the Massachusetts Turnpike are no longer in place and there have been no significant incidents. There are several road closings on Route 2 and State Road in Irving and on Route 9 in Ware. There are also multiple trees and power lines down in the Brookfield areas, according to state police. Spencer police reported Route 9 in Spencer was closed, and the town set up a shelter at the Knox Trail Junior High School. In Dudley, Fire Chief Dean C. Kochanowski said that 76 percent of the town lost power. The town opened a warming center at the Senior Center, in the Dudley Municipal Center on Main St. Public safety officials are considering opening the high school as a shelter. National Grid told Dudley public safety officials that it could take up to four days to restore power and that there are 17 main lines that have been severed. A National Grid spokesman said the company was sending helicopters to determine the location of the breaks. Dudley was opening a shelter at Dudley Middle School, at 70 Dudley-Oxford Rd., at 6 p.m.
Leicester opened a shelter as well, at Leicester Middle School. About half of Leicester's homes were without power as of 5 p.m. today. Officials say there may be icy spots on roads, sidewalks and parking lots. They also caution that the wet, heavy snow could cause tree branches, power lines and other items to fall. In a Northampton neighborhood, Dale Carhardt shoveled the sidewalk for neighbor Janet Richards. Neither had power this afternoon, but both were taking it in stride. "I'm not sure about tonight, if I should stay in a motel or not," Richards said. "At some point in time I'll decide, but until then, there's not much to do, read, take a walk around, stuff like that." Before this weekend, most parts of Massachusetts had seen no more than an inch of snow from an October storm, with the record closer to 6 inches in higher elevations. Some places in Western Massachusetts got as much as 29 inches of snow Saturday and Sunday. A train from Chicago to Boston got stuck Saturday night in Palmer, when a rockslide caused by the storm blocked the tracks about 10 p.m.
Amtrak spokeswoman Vernae Graham said the 48 passengers who spent the night on board had heat and electricity and were given free food and drinks. Buses arrived about 11 a.m. today to take them to their destinations. Train service was suspended in much of the Northeast corridor, including between Boston and Providence and between New Haven, Conn., and Springfield. In Ashburnham, Sarah Arel was shoveling and raking snow off the roof of her 1780s farmhouse this morning. "It's beautifully white," she said. "However, it's very deep, very heavy, and we must have gotten over 20 inches." She said she and her husband were surprised to see so much snow in October. "I did not expect this at all," she said. "Winter is not our favorite season. This is a little bit too early knowing how long winter lasts." At least one death was blamed on the storm, a 20-year-old Springfield man electrocuted when he stopped near police and firefighters examining downed wires, police Capt. William Collins said. Power was out in much of the city and lines were down all over. Just two months ago, Irene knocked out power to hundreds of thousands of people and some remained in the dark for a week, prompting complaints about how utilities responded. "It's a little startling. I mean, it's only October," said Craig Brodur, who was playing keno with a friend at Northampton Convenience in Western Massachusetts when the power went out Saturday night, forcing the half-dozen people inside to scatter. The forbidding forecast had Boston Mayor Thomas Menino urging Occupy Boston activists who've been camped out on a downtown square for weeks in an anti-Wall Street protest to leave for the night. But media volunteer Jason Potteiger said that about 200 people still staying in tents at the site were in good spirits and the people running the food tent had more donations of hot meals than they knew what to do with. "The term solidarity is used a lot in this movement, and I think the sentiment that's all over camp is that if Oakland and Denver can make it through tear gas and rubber bullets, we can make it through a little snow and sleet," he said.